Help uncover the Veiled Heritance in Mathiisen. I've uncovered evidence linking important community members in Mathiisen to the Veiled Heritance. Now Raz has asked me to take the fight to them directly. 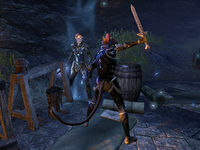 In Mathiisen, speak to Razum-dar who tells you to enter the barracks where the suspected Heritance traitors are and allow them to capture you. Talk to the Mathiisen Guard to the southwest and gain access to the barracks. Find the canonreeve and attempt to arrest her, resulting in your capture. Wait to be released from the prison cell and speak to Razum-dar for further instructions. Find and defeat Condalin, then talk to Razum-dar outside the forge who informs you that Malanie is trapped inside the forge. Enter the forge and find your way to the Smuggler's Tunnel. Leave the tunnel and talk to Razum-dar outside for a reward. 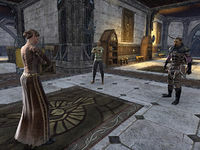 Razum-dar tells you that Condalin and Canonreeve Malanie have gone to the barracks and that you should lower their guard and gain access, by allowing yourself to be captured. To gain access to the barracks you must talk to Sergeant Iralundore who stands watch at the barracks' entrance. After your bombastic request to meet with Canonreeve Malanie, Sergeant Iralundore bids you enter. Canonreeve Malanie is at the end of the hall with Condalin. You approach her, confront her with accusations of conspiring with the Veiled Heritance and attempt to arrest her but you get knocked out by Condalin and wake up in a cell. Razum-dar is at the cell door and will release you after you have spoken with him. He tells you that you should seek out and defeat Condalin while he finds Canonreeve Malanie. Razum-dar thinks Condalin will be organizing his men at his house, which happens to be next door to Fistalle's house. After you defeat Condalin you go to find Razum-dar outside the forge. He says he has trapped Canonreeve Malanie inside and that you should enter the forge and defeat her. Upon entering the forge you should head SE to the entrance to the Smuggler's Tunnel where Canonreeve Malanie has sought her escape. After fighting your way through members of the Veiled Heritance you find and confront Canonreeve Malanie alongside Razum-dar. After defeating Canonreeve Malanie, Razum-dar tells you that he shall meet you outside. The parts of the quest involving entering the forge and killing Malanie has text that implies that Razum-dar will accompany you. This does not happen. Razum-dar has asked me to trust him, and do something seemingly foolish. I'm to openly accuse Malanie of treason in front of her men. I'll need to enter the barracks first. I need to confront Malanie about her involvement with the Veiled Heritance. And hope Raz keeps up his end of the deal. I woke in a cell under the barracks. Raz, as promised, waits for me outside. I must find Condalin and destroy him. I need to find Raz, so that together we might put an end to this treacherous Heirtance [sic] cell once and for all. This is it. Raz and I are going to kill Malanie and put an end to the cell here in Mathiisen. We've done it. Malanie and Condalin are dead. I should speak again with Raz outside the forge area. Finishes quest I should speak with Raz once more to end our business in Mathiisen.